Home › Uncategorized › Are we trained to criticize everything? After finishing the master program in system dynamics and starting working as a Ph.D. student, I recognized that I am quite often trying to find weak spots of theories, research articles, even news and television shows. It is almost like an addiction, I cannot stop focusing on it and I am asking myself if this is normal? In the following, I am presenting a study as one example of many and I chose it because, I had several arguments against this research in mind. I thought I would share the results with you. I have recently listened to a podcast of the Freakonomics Radio called “Why do people keep having children?”. Emily Oster from the Brown University serves as an expert on population, fertility and mortality. Note that just in the moment of writing this blog article I related these variables to stock and flows but actually my further critique is not based on a system dynamics perspective per se. Amongst other things, the hypothesis she presents in the podcast is based on a paper where she analyzes the impact of television on fertility. For that research, she used data from India and focused on the effect of getting access to cable television on fertility. She argues that when people start watching TV, they will watch soap operas and the fertility decreases. Her interpretation is that people reflect the life presented in the soap operas on their own life. People usually see people having no or fewer kids but a fancy life style and thus people will have fewer kids in order to copy such a life style. She also mentions that she considered another interpretation, i.e. people are too busy watching television and thus fertility drops. At this moment, I switched off the podcast and thought that it is strange that the narrow interpretation (soap operas show fancy life style) was accepted and the broadest interpretation (television is time consuming) was smiled at and not discussed. At a later moment, I was listening to the full podcast and indeed no one picks up the broader explanation. Don’t get me wrong, I do accept her interpretation but I cannot believe that her interpretation is the most important one. Here are the reasons why I believe the narrow interpretation is not the most justified explanation: First I go to the traditional economics view using a Venn Diagram and a two dimensional graph, then I will shortly bring two other examples why the broader interpretation seems more logical and more significant. You can watch television without watching soap operas but you cannot watch soap operas without watching television. Note, that I exclude theaters for this argument. So, as shown in the figure below we show that watching soap operas is always part of watching television, no matter how much time of watching television is used for watching soap operas (the two Venn-Diagrams on the left). Thus, both of these activities are time consuming. The right side of the figure shows what is not possible: The extent of watching soap operas is outside of watching television. Having understood the relationship between ‘Watching Television’ and ‘Watching Soap Operas’, we will now include the factor ‘time’ in our analysis. The next graph is a two-dimensional graph mapping time for doing everything else but watching television and the time spent for watching television. Note that in both cases the time spent cannot exceed 24 hours. In this graph, we can see that watching television will be subtracted from the time a person can spend on doing whatever they want but watching television. 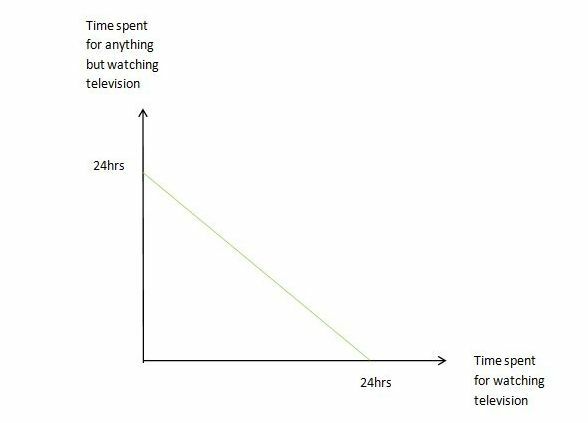 We graphically move on the green line depending on how much time is spent for watching television. Moving downwards means more time for television and less for anything else. Moving up means the opposite: less time spent for watching television and more time for anything else. Note that ‘watching soap operas’ will therefore be located within the triangle, since the maximum time spent for watching soap operas can only be the time spent for watching television but, more likely, will be less. We learnt this fact above: ‘watching soap operas’ cannot not exceed ‘watching television’. We can therefore conclude two things so far: first, since ‘watching television’ includes ‘watching soap operas’, ‘watching television’ is a broader construct and second ‘watching television’ is time consuming and subtracts time for doing anything else – and so does ‘watching soap operas’. So far, I have supported my opinion that the time consumption of watching television is a reason for the decrease in fertility. I also explained why I claimed the soap opera argument as a narrow explanation and why the time consumption is the broader explanation. In this last part, I will now discuss the weaknesses of the narrow explanation. Especially, I focus on three arguments (1) the inverse effect and policy planning, (2) the effect of other media and (3) the role of Bollywood films. First, soap operas and television were not part of any famous policy. Let’s assume that the research presented in the radio show was right and people do indeed adapt fancy soap opera lifestyle – why did countries with high population like China, Bangladesh and other very populated countries did not focus on bringing television and soap operas into every household in order to regulate fertility instead of regulate it by the “one-baby-policy”? Furthermore, this research should also tell policy makers that soap operas can increase fertility. For European countries or Japan, where fertility is low, soap operas should promote a fancy lifestyle with a lot of children and thus the problem of a shrinking population will be appropriately solved. Is that possible? Can a region be found where soap operas are showing huge families and where the fertility increased? Second, why people are so susceptible to that fancy image of soap operas while fancy journals, magazines and books do not have such an effect? We can undoubtedly assume that books and journals or only images are widely spread and even rural areas have some access to those media when not being connected to cable television. I have never heard of any effect that the lifestyle of the protagonists of a book or the pictures in a journal or magazine influence the fertility rate. Well, maybe no one ever looked at it before. I believe if the research presented holds true, there should be evidence on the influence of books and images as well. Third, India is the most productive country in producing films. I do not belong to the Indian culture and I have not seen a lot of Bollywood productions but the films I have seen where romantic including a happy end, big families and networks of friends (who are dancing at some point of time). Now, I am asking myself if these films should not have any effect on fertility. All arguments presented to support the initial outcome of the research were based on the fancy lifestyle of soap operas. I assume the biggest market of Bollywood productions is India. Thus, it seems not logic to me that people will watch soap operas instead of Bollywood films or when they watch it, that soap operas have a higher influence. I am seriously surprised how much time it took to write this down since all these ideas originated in the moment that I listened to the podcast. I immediately started criticizing it. Still, I want to emphasize that I think that the research done by Oster and her colleagues is probably significant and good research should provoke discussion. I even think that there might be something to it but I do not believe it is the most important factor. At the end of this critique, I want to raise the question if we were trained to think critically and to criticize in general when taking the systems thinking perspective (even though maybe not in system dynamics terms). As systems thinking students, do we learn to scan facts in order to find weaknesses and to confirm their truth or do we become arrogant and try by hook or by crook to prove the advantages of systems thinking? Very Interesting article and especially the question at the end. I agree that perhaps some of those who practice systems thinking might be looking for mistakes even when it is not important to spot them or even maybe when they do not exist. In my opinion, what brings these two point of views together is to never forget that systems thinking has nature at its ultimate guide. It is too complex for anyone to truly understand it and let alone try to figure out its “system”, hence systems thinking is in most cases a speculative approach to how things work which has proved to be equal if not better to other approaches. So, what i am trying to say is that when something seems to function well, we have to think why it is functioning well rather than what are its weaknesses because we might discover that there are plenty of systems out there that function perfectly well without intervention and definitely a lot better than what any systems thinker can hypothesize. Hey Wissam, thank you very much for your comment! I think you are right, that systems thinking and especially system dynamics leads to “visualisation”, i.e. the question of why something works well or actually not – we are trained to focus on the white box somehow and, in addition, we learn to make quick connections and get the feeling about what kind of forces might be main drivers. But now wait: There is the thing called counter-intuitive behavior of complex systems. Thus, do we visualize and get some degree of understanding of how something could work, or do we get arrogant and think we understand a system better than others because we make some quick connections? I mean, look at my article – I am kind of arrogant actually argueing against a scholar at Brown University who spent years analyzing fertility rates and human behavior and I criticize these findings by only listening to the results (while cleaning the flat btw…). Still, I think my critique is justifiable. I am wondering, however, if the explanations given by Oster might be exactly that counter-intuitive behavior? Do we trap ourselfs? Do we gain too much confidence?